We know that birds are smart – sometimes too smart for their own good. But one colorful pair of parrots is showing us these stunning animals are quite athletic too. 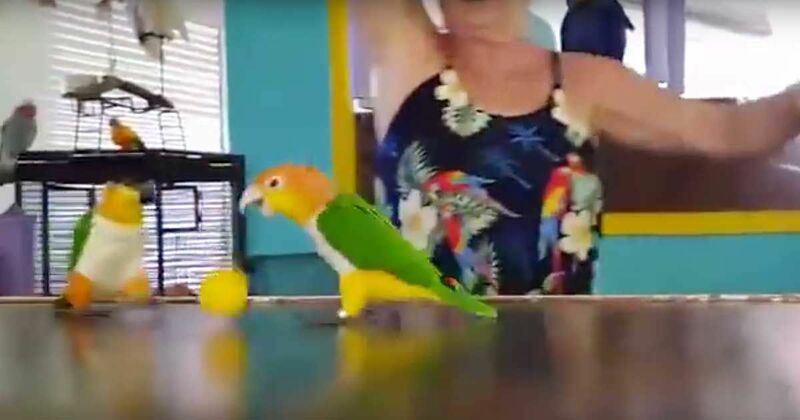 In this viral YouTube video, a woman drops a ball in between two little Caique parrots and they actually start playing a game of basketball! That's right - these animals might be small, but they're pretty quick on their feet. The two parrots take turns grabbing the ball, running it down the 'court,' and doing a slam-dunk in the other's basket. We have to admit, the birds are a bit more cordial than the athletes we see on the big screen - and there's not too much defense. But regardless, it's quite a sight to see these parrots run up and down the court and actually make these shots. You've got to see this one for yourself - so check out the video below and be sure to let us know what you think in the comments! Those are some incredible birds, right? Be sure to share these basketball-playing birds with your friends on Facebook, Twitter and Pinterest.